The link to the pcap file is broken. Apologies for the broken link. It appears that my hosting company doesn't have a MIME type defined for .pcap files hence the 404. I've renamed the file so you should be able to get it now. Just rename back to .cap or .pcap to have it automatically open in Wireshark. Hi Ken, Thanks for all this great information! This looks like your going exactly where I am now with the next post (Kerberos delegation across domain forests). 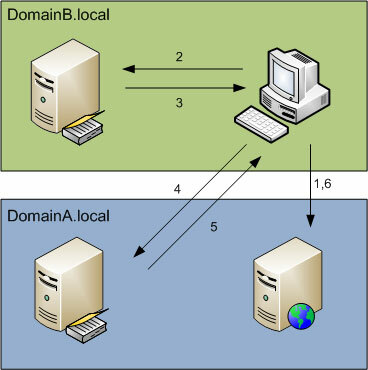 I have an issue with clients in domainB.forestB being able to successfully access resources domainA.forestA (forest trust in Native 2003 forest functional level established) but I am unable to delegate credentials of users in domainB to resources in domainA. Not surprisingly I'm not able to find much information about this type of scenario and was hoping you might be able to provide some guidance (prior to your next post :) if possible). Thanks! In the above two cases, if you are using constrained delegation from IIS -> SQL or from ISA -> IIS, then those two servers must be in the same domain. The original user can be in any trusted domain. Are these domains in separate Forests, and you have created an external trust between them? If so, then you can't use Kerberos. 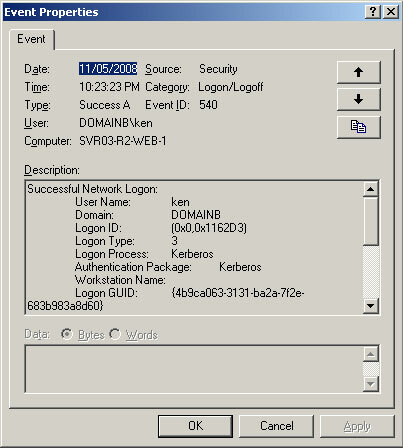 External Trust (between Windows 2000 function level Forests) only allows NTLM. You need to have a Windows Server 2003 functional level Forest to create a Forest Trust.